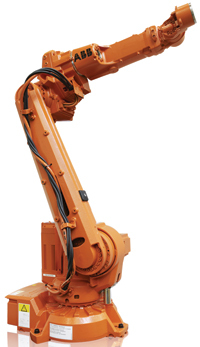 ABB Robotics, Auburn Hills, MI, has introduced the 1.85-m reach, 15-kg-payload IRB 2600ID (Integrated Dress) robot, which features a flexible conduit in its upper arm/wrist for routing cables and hoses for signals, air and power. It’s designed for a range of material-handling and machine-tending applications, and with the internally routed dress pack, the movement of hoses and cables is completely predictable, simplifying offline programming. Without needing to account for swinging cables when simulating robot systems, the time required for fine-tuning programs is minimized by as much as 90 percent. Applications include case packing, carton handling, palletizing, and press and machine-tool tending. The IRB 2600ID can be mounted in multiple configurations and features a work envelope that extends well below its baseline, making it ideal for machine-mounted applications. With hoses and cables firmly secured and protected, exposure to cutting fluids and other sources of overall wear is minimized.